Auckland residents say that stormy weather has provided them with the comforting illusion that something dramatic is happening. A series of heavy storms across the country has provided observers with the distinct impression that something is happening in New Zealand. 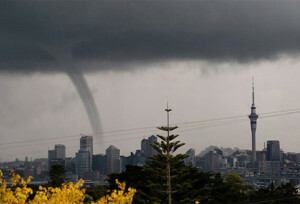 A low pressure system brought thunderstorms to several highly populated areas of the country over the last two days, and Auckland residents have witnessed tornado-like phenomena known as water spouts emerging over Manukau Harbour. Gary Wishart, a resident of Mangere, said that the various weather phenomena brought to him an eerie feeling of calm and purpose. Other residents reported that they felt like they could be in “Oklahoma or someplace,” and weren’t about to waste the newfound feeling of tension and drama in their lives. Many lone Aucklanders made their way to their nearest beach last night to stare out to sea and feel as though they were perched on the edge of a world-consuming abyss. Others, such as One News journalist Sam Wallace, traveled to Auckland Airport to take footage of planes taking off in the rough weather.